There's no denying that every business today needs a website not just to showcase their business, their products or services but to also help the company generate new sales opportunities and to drive sales. But where do you start? There's so many options available to business owners and marketers when they're looking to create a new website that the information available can often be intimidating and sometimes confusing. That's why we've created this page. To help you understand everything you need to know when creating a new website for your business. Here's how to get started… and a whole lot more. Who will visit your newly designed website? How many pages will your new website need? Do you need a blog for your new website? What technology will your new website need? How do you generate sales leads on your new website? Will you need a maintenance contract for your new website? How do I purchase a domain and how should I host my new website online? How do you get your new website to show on Google searches? What if I have a website already? Will my new website replace the old one? How do you measure the traffic on your new website? It's completely plausible that more than one of the above applies to your business. And that's absolutely fine. The most important thing to ensure at this stage is that whatever your goals and objectives are, these need to be 100% relevant for your business. If you do have the ability to look at existing data and use this to define new goals and objectives for your new website design, this will help you make better decisions relating to the new website's design, functionality, content requirements and marketing budgets. Who will visit your new website? Before launching into the design and development of a new website, it's absolutely vital that you have a deep understanding of (a) who you want to attract to your website and (b) what do you want them to do once they land on the website. We call this 'persona development' and it's likely that you've already identified your website audience and documented this somewhere in your business or marketing plans. It's possible that your business has more than one persona group (or target audience) that you will target for your website. It's therefore important to list these out and at the same time attempt to understand the objectives of that persona group when they visit your website. What is it that they are looking for on your website? What would a teacher look for on the website? General information about the school, Careers page and contact information, teaching team. Once you have a clear understanding of your website's intended audience, you should also have a outline list of the type of content that your website will need. It's important to employ a 'customer-first' approach to this process to ensure that your website caters to the needs of those who you want to target to the new website. One recommendation here is to engage a existing customer (or group of customers) and ask them what type of information they would look for on your website to help them. How your website looks is often the major determinant of whether your new website is deemed a success or not inside a company. But that can be a dangerous approach. While it's tempting to have a visually stunning website that looks beautiful, it's also important that your website functions properly in order to help you achieve the goals and objectives outlined previously. While functionality and features may not be as important if your sole goal is to impress visitors this may not be the case if performance metrics such as sales leads and revenue growth is your prime objective. Navigation (Menu): Keep your navigation as simple and as relevant to your audience as possible. The more complex your navigation, the more you are likely to confuse website visitors, so it's important not only to keep your navigation menu simple but also ensure that the naming of each menu option is clear and easy to understand by your intended website audience. Website Structure: Website design and usability will impact whether your new website is a success or not, so it's important that the website is structured in a way that allows visitors to find the information they are looking for quickly, efficiently and without frustration. Try to map out your typical visitors website journey not just from your home page but from other pages on your website. Search Engine Visibility: From a sustainable marketing perspective, it's important that your website is visible on search engines such as Google so that organic traffic can be driven to your website. Therefore, think carefully about the content that you will have on your new website. You need to ensure that informative content, perhaps the type of content that prospective customers would search for and find interesting, is contained within your new website. Type of content: Also important to consider is the type of content that your new website should contain and should be influenced by your knowledge of your customer. Would they relate more to text based content or would they prefer videos about your business, product or services? It's important that you use this information to map out the type of content that your website needs, during the design process. Lead Generation: Will you use your new website to help generate new sales opportunities for your business? If so, it's important that you create as many lead generation opportunities for your business, across your website, so that website visitors (and potential customers) can connect with your business easily and efficiently. Think about placing enquiry forms, or even pop-ups (also know as lead flows) in strategic parts of your website to maximise lead generation opportunities. Whoever you work with to build out your website design, make sure that all parties have a clear, understandable and logical site map for your new website that details each section, sub-page and page on your website. Ensuring this is in place will help you launch your website on time and within budget. It also gives you an opportunity to reduce the scope of work should the initial site map require more pages, content, design and development work that your budget allows. 1) Does your business have competitors who are ranking well on search engines such as Google? 2) Is it important for your business to rank amongst the top positions on a search engine? If you answered "yes" to both of the questions above, then simply put, your business does need a blog. If you answered "no" to any or both of the questions above, then we'd recommend that you research competitors and then decide if having the ability to add regular content on your new website will help website visitors learn more about your company. Google have long advocated the use of a blog on a website and have consistently advised businesses to upload quality new and unique content to a website as regularly as possible. By doing so, and as Google mention above, a website's reputation not just with website users, but with Google themselves positively increases. For businesses in highly competitive industries, we would strongly recommend creating and updating a blog on a regular basis by adding fresh, new and highly useful content that will help potential customers trust your business. Many businesses are unsure about the type of content that they should include in a blog but this doesn't necessarily need to be a challenge. For example, think about the types of sales questions potential customers ask you or your sales team. More often than not, that prospect may be asking you because they couldn't find answers to their question online. By answering this question in a blog article, not only are you helping solve problems that your website visitors may be having, but you're also helping Google fill a search void! What technology will your new website design need? When we discuss website technology, there are two main areas of concern when creating a new website. The first of these is the 'front-end' technology, in other words, the areas of your website that your website visitors will see and engage with. It's therefore important to ensure that your website performs well in terms of speed, page rendering and content accessibility. It's also vital that your website design displays perfectly on all types of devices and not just desktop machines or laptops. Over 50% of web traffic today comes from mobile devices, which come in many shapes and sizes. When speaking to your website design vendor, ask them to explain their recommended approach in terms of front-end technology, once they have a clear understanding of your business and the goals of your new website. The second is your website's design's 'back-end technology'. Many people will refer to this as a 'content management system' or 'CMS' and again there are many technologies available (Eg Wordpress, Drupal, Custom etc). It's important that you explain your specific requirements to a website design vendor in order for them to be able to suggest the most appropriate CMS for your business. For example, is your website design likely to scale in the future? Will you be adding more products and services in the future? Will you be adding e-commerce features to your website design in the future? This type of information will help determine the most appropriate solution for your new website and save you money in the long run. We've touched on this previously, but such is it importance, we'll look at this in a little more detail here. Whenever you're trying to determine the type of content your website visitors will respond to most, it's important to have a clear vision of who your target audience is likely to be. Once you have a clear understanding of our target audience, think about the type of content that they will relate to. For example, if your business is highly technical, perhaps a 45 second explainer video would help. Alternatively, if your target audience is likely to want more written content during the research stage, think about offering blog articles, e-guides and white papers. Whichever direction you go in, once your new website design is live, make sure that you user test the website and implement any critical feedback to achieve strong results for your business. Driving quality traffic to your website. Without traffic, there can be no leads, so it's important that you drive qualified traffic to your website. Look after your guests! What happens when a user visits your website? You need to make sure that their experience is positive, that they have access to the information they are looking for and can easily connect with your business. Easy to connect without distraction. Your website's sole purpose may be to generate qualifies sales leads so don't overload prospects with too much content, information and navigation options! Keep it simple and your website visitors can work through the journey you intended for them, which should end in the creation of a sales lead. Optimise and start again. It's important that you track the effectiveness of your lead generation strategy by measuring visitor-to-lead metrics and optimising these wherever possible. Once you do that, start measuring again. Rinse and repeat until you're satisfied with your results. How much does a new website design cost? Number of pages on your new website. Size and complexity of your new website. Choice of CMS or website framework. Type of content that will be hosted on your website. Types of tracking tools or integrations required. We've discussed this topic at length in another article which can be found here. Most website design vendors are happy to offer businesses some form of maintenance or warranty agreement, which not only offers peace of mind for business owners in the event of website breakdowns but also to ensure priority support for website design or content updates. Your website design vendor may also be the first point of contact if your server fails causing your website to go down and in those instances, it's always important to ensure that your website is up and running as quickly as possible especially if your website is important from a sales, marketing or even business reputation perspective. In summary, while website warranty and maintenance isn't essential, it is something that is relatively cost effective and can help ensure that your website performs to the highest standard at all times. How do I purchase a domain and how should I host my new website? When registering and securing your website domain, it's important to stick to high quality and reputable vendors. It's also important that you are the registered owner of the domain and not the domain vendor, website design, host or the development company. To register your domain, we recommend companies such as GoDaddy.com for general .com, .net or .co domains or 101Domain.com for more localised and country specific domains. Try to avoid hosting your website with your domain provider. In case that provider's business fails and collapses, you don't want your domain and website to be stuck in any 3rd party bankruptcy issues. When purchasing website hosting services, make sure that you take the advice of your website designer / developer and select a host that provides the correct server specification that complies with the requirements of the website platform that your new site design will be built on. It's always important to check bandwidth and disk space when selecting a server. If you're unsure of how much disk space or bandwidth your new website design will require once developed, again it may be best to ask your website design vendor. Also, it's important to consider what may happen if your new website design becomes popular and attracts high-levels of traffic. You need to ensure that your server and hosting environment can manage increased level of traffic without your website crashing. Check the backup capabilities of the hosting provider and select a backup package that suits the requirements of your business and website. If you're likely to add new content to your website on a regular basis, you may need to backup your site more regularly. Contract terms for website hosting are often for a minimum of one year although some providers do charge monthly and do so often for a small premium. How do you get your new website design to show on Google searches? Search Engine Optimisation (SEO): The process that positions your website in a way that is compliant to the recommendations made by the major search engines (Eg Google, Bing & Yahoo) in order to drive organic (free of cost) traffic to your website. Search Engine Marketing: Often referred to as 'PPC' or 'Pay per click advertising', websites use search engine marketing by placing adverts (either text based or banners) on search engines and other websites to capitalise on a individual user's specific searches. For example, if you are a Printing company located in Manchester, England, you'd want your advert to be seen whenever a prospective customer is searching for Printers in Manchester or Printing companies in Manchester. Social Media Marketing: Social media platforms such as Facebook, Instagram, Twitter, LinkedIn, Pinterest and Snapchat contain vast amounts of consumer data and allow businesses to tap into this by placing targeted adverts and communication to those most likely to be interested in your business. Each advert can contain a link directly back to your website. If you already have a website, it would be a mistake to simply switch off your old website and switch on the new one and this is a common mistake that many, many businesses make. The reason for this is that search engines such as Google will already have indexed (or listed) your website on its search engine. It does this by remembering your website URLs (or links) and then references your website within its search engines results pages whenever a user searches for information that exists on your website. If you suddenly change your website design, the URL structure or any links without 'telling' Google, the search engine may continue to send users to your old website links. If your old website no longer exists, your users will likely end up on a error page or at best a 404 page, which tells the user that this page is no longer valid. To avoid this, you need to speak to a SEO specialist that will help you migrate your new site into a live environment who will also take care of the process required to alert the search engines of your website design update. Part of this process is to use a permanent 301 redirect from every page of your old website links to the relevant pages on your new website design. It's vital to ensure that this is done for all pages of your website as Google not only indexes every page on your website not just your home page. 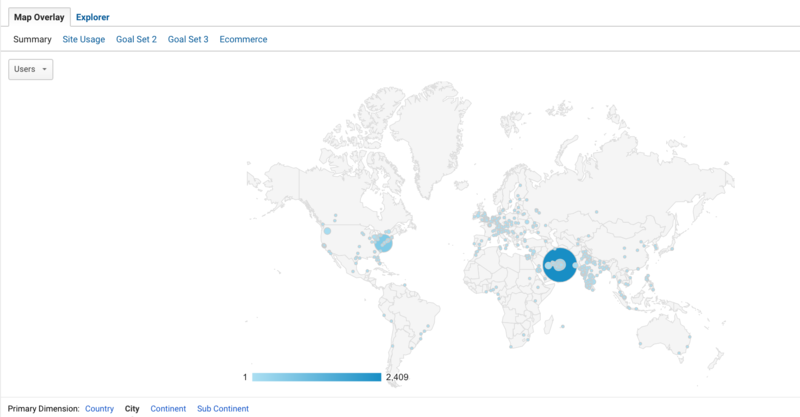 Location of your website audience: From which country or city is your website being accessed? Devices. From which devices do your site visitors access your new website? Goals and Conversions. How well does your website perform in terms of meeting your goals and expectations? Building a Website:How Much Does It Cost?